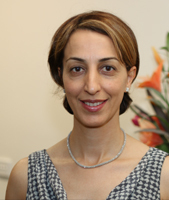 Dr Fariba Kavianpour is a clinical psychologist who joined 195 Specialist Centre in 1992. She completed her Masters and PhD in clinical psychology and is a member of the Australian Psychological Society (APS) and the APS College of Clinical Psychologists. She specialises in Cognitive Behavioural Therapy. For several years she has been working as a clinician in public mental health and private practice where she has gained experience and expertise working with severe and chronic mental health issues such as psychosis, depression and bipolar disorder as well as personality disorders. Her experience and interest include working with adolescents and adults on issues such as depression, anxiety, bipolar disorder, psychosis, obsessive compulsive disorder, eating disorders, self-esteem, sleep disturbance and assertive training. She is a bilingual psychologist and is able to provide her services is both English and Farsi/Persian. Clients with a Mental Health Care Plan are able to utilise Medicare rebate to ensure that services remain affordable. Clients with health care card are bulk-billed. For referral, clients could directly contact the clinic.